While the summer weather has been a little inconsistent recently, with cloudy days and heavy rainfalls making it feel like the middle of spring, it’s good to have a reminder that we’re actually coming up onto the beginning of July. 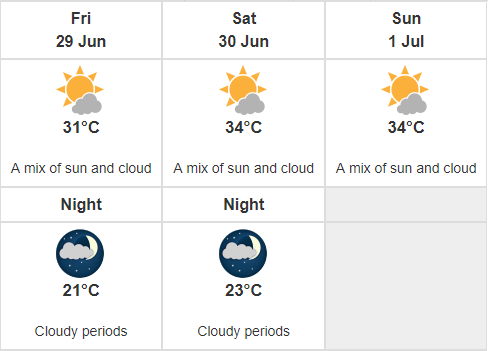 According to Environment Canada’s weather forecast, we can expect temperatures in the low to mid-30s from Friday to Sunday, with a high of 34 degrees Celsius on Saturday and Sunday. We’ll update with any further developments as the weekend approaches.